If not in stock, usually ships in 3-4 days. Direct-port system for carbureted single cylinder engine. 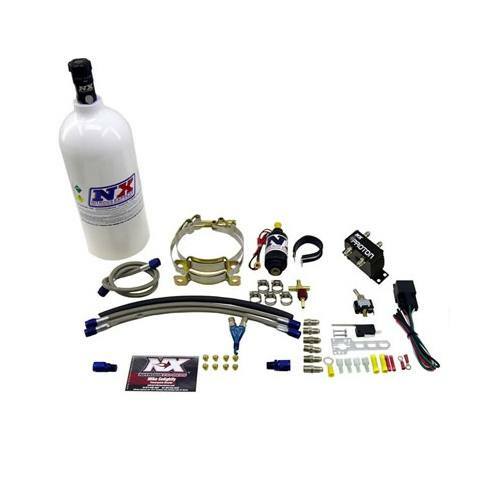 Includes the "PROTON" solenoid assembly,braided stainless hoses,Piranha nozzle,fuel pump, relay,microswitch, arming switch, jetting for 10,15,20 or25HP.bottle and bracket. All components must be of the highest quality! 99% of NX products are produced and assembled in the USA! All NX components and systems must be tested and proven before they are shipped! All horsepower claims must be accurate and dyno proven at the wheel! NX copies no one; we lead the industry in technology and innovation! Never be satisfied with the status quo! Always give the customer more than he expects!